Registered dietician Christine Twait hit the ground running when she became the Director of Nutrition Education for the Providers Choice food program in Minnesota. She developed Twist and Sprout, a comprehensive program to make it easier for child care providers to comply with new meal requirements from the Healthy Hunger-Free Kids Act. Twist and Sprout is based on best practices from several national sources, including Caring for Our Children, NAP SACC, Let’s Move! Child Care, the Institute of Medicine report CACFP: Aligning Dietary Guidance for All, and recommendations from Dr. M. Susie Nanney from the Department of Family Medicine and Community Health Department, University of Minnesota. 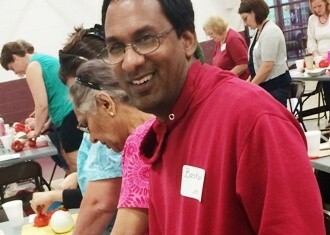 In June 2014, Providers Choice field staff presented training workshops focused on culinary skills development and healthy eating best practices in 13 sites in the Twin Cities metro area. More than 200 family child care providers attended these trainings. The staff offered 39 additional workshops, focused not only on healthy eating but also breastfeeding support and active play, at sites across the entire state from July 2014 through April 2015. More than 500 providers attended these workshops. All the workshops focused on skills-building and included goal-setting and wellness policy components. Twait is prioritizing training opportunities for providers that serve in low-income communities. Twait also developed a number of technical assistance tools. She worked with Chef Marshall O’Brien to develop four-week cycle menus for each season. Chef O’Brien kid-tested all the menus. They produced a video to accompany each menu day. In the videos, Chef O’Brien visits a child care, prepares one of the recipes with the children who taste-test the meal and endorse the delicious recipes. Twait created a ten-video series called Save Time and Money in the Kitchen. These videos build providers’ culinary skills and nutrition knowledge. The videos feature Chef O’Brien and Christine Twait and cover a range of topics — including cooking with whole grains, kitchen-gadget know-how, cooking with kids in the kitchen, and more. Providers Choice is contracting with the Food Research and Action Center to develop an evaluation plan for the new program. The plan will include outcome indicators as well as process indicators. In St. Paul, Minnesota, a unique partnership — among the Institute for Agriculture and Trade Policy (IATP), the Community Action Partnership of Ramsey & Washington Counties Head Start (CAPRW), the Hmong American Farmers Association (HAFA), and the Minnesota Blue Cross Blue Shield Center for Prevention — is bringing healthy, fresh food to six Head Start centers across the city. This educational series from MyPlate has easy-to-follow, downloadable tip sheets—perfect to post on the refrigerator or as a take-home for parents. Topics include: Kid-Friendly Veggies and Fruits, Cut Back on Kids’ Sweet Treats and many more.